My thanks to Cityluxe for loaning me the pen for review. 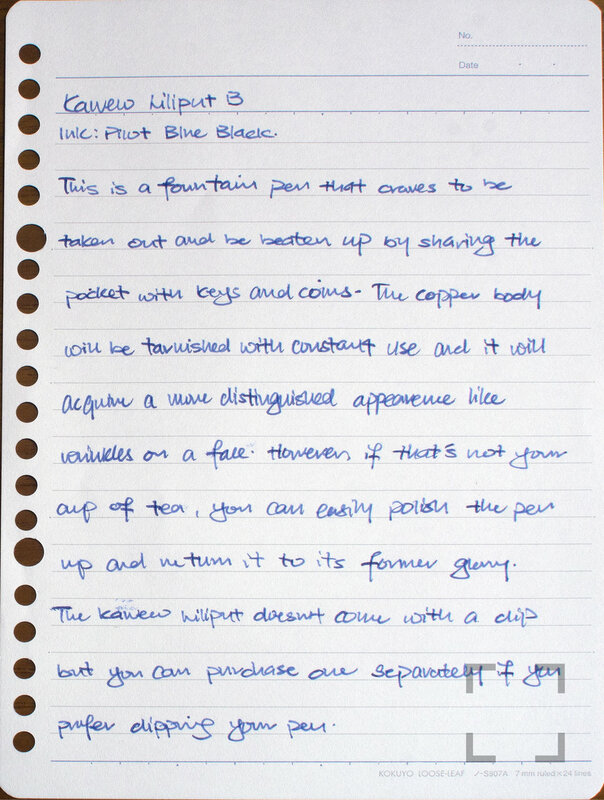 The Kaweco Liliput is the ultimate pocket fountain pen. It is very small and compact but in particular with the copper model it packs quite a punch. The Kaweco Liliput comes in a number of finishes, namely the stainless steel (in silver and fireblue), copper, aluminum covered in clear lacquer (in silver and black) and eco brass (in regular or wave). Measuring only at a tiny 97mm capped, it fits in the pocket easily. With a metal body, it will be able to take the knocks of daily carry life. 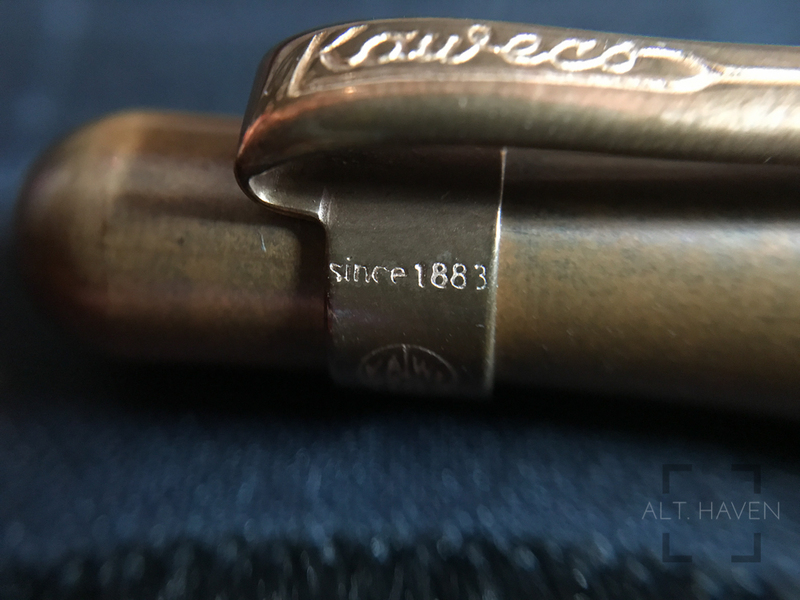 The Kaweco Liliput comes in the standard Kaweco tin box. I really like the tin box because it can be easily re-purposed for plenty of uses. The design of the box reminds me of the mathematical instruments I have for school. The cap unscrews in less than 3 revolution. Though small when first uncapped, the cap can be posted by screwing it to the end of the barrel. By simply posting the cap the pocket pen morphs into a full size pen. 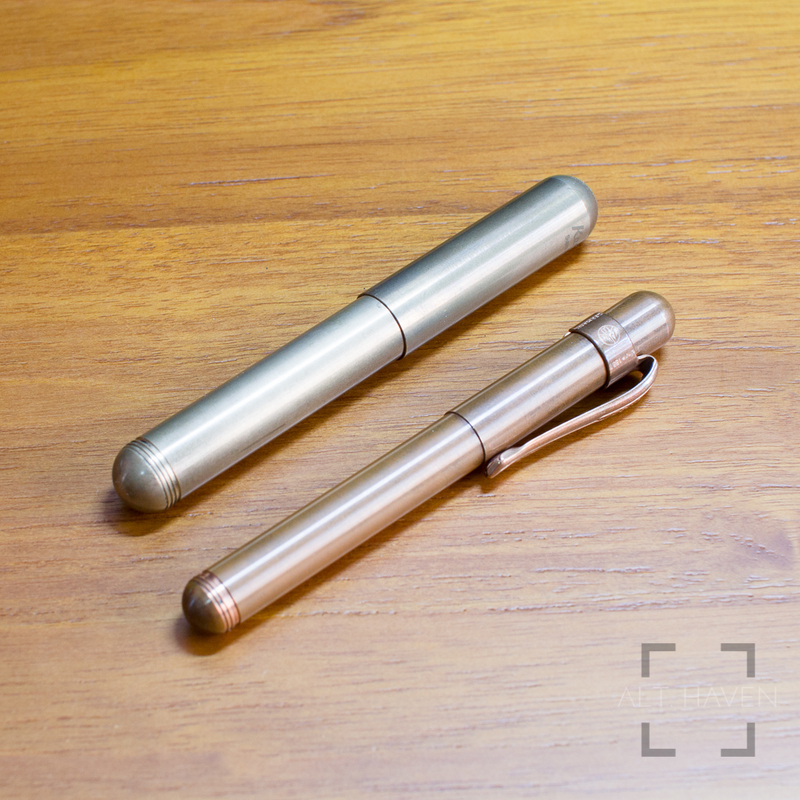 Couple with the weight of the copper material that helps to centre the pen in your hand. The balance is just right for my hand, I can even use it unposted if I am in a rush. This is a fountain pen that craves to be taken out and be beaten up by sharing the pocket with keys and coins. The copper body will be tarnished with constant use and it will acquire a more distinguished appearance like wrinkles on a face. However if that’s not your cup of tea, you can easily polish the pen up and return it to its former glory. The Kaweco Liliput doesn’t come with a clip but you can purchase one separately if you prefer clipping your pen to paper or your jeans. The clip would work well as a roll stopper as well. Be careful of the Liliput, it tends to roll of the table especially when without a clip. The Liliput is without a doubt a thin pen. Its section is long but narrow so people with larger hands I would recommend you check out the Kaweco Supra for a more comfortable grip. However the thin grip is by design, after all this is suppose to be the ultimate pocket pen. You are not meant to be writing long essays with this pen. This is for quick jotting down of notes while out of your home. 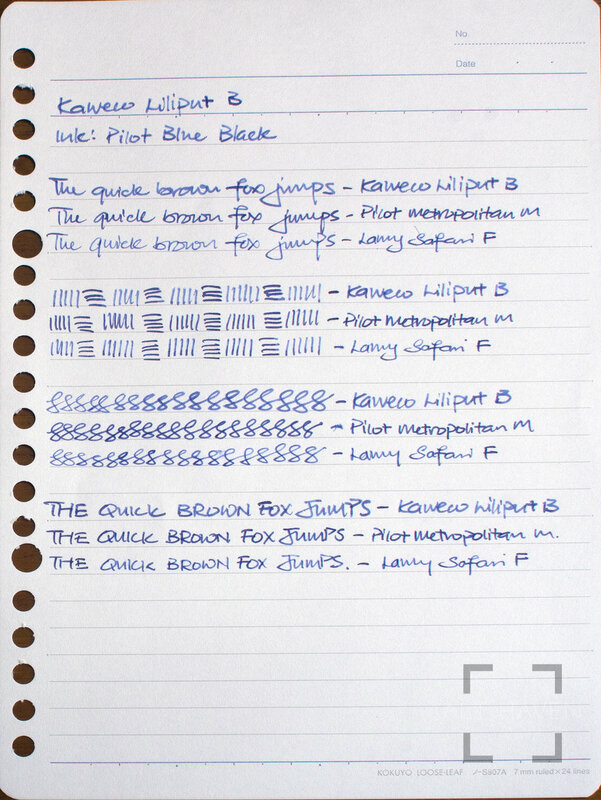 The Kaweco Liliput takes the short international cartridge only. If you prefer using your own inks, you will be resigned to refilling old cartridge if you like a decent ink capacity. I can’t be sure if the small Kaweco converter would be able to fit the Liliput. If it does, I doubt there is much ink capacity when compared with a normal ink cartridge. 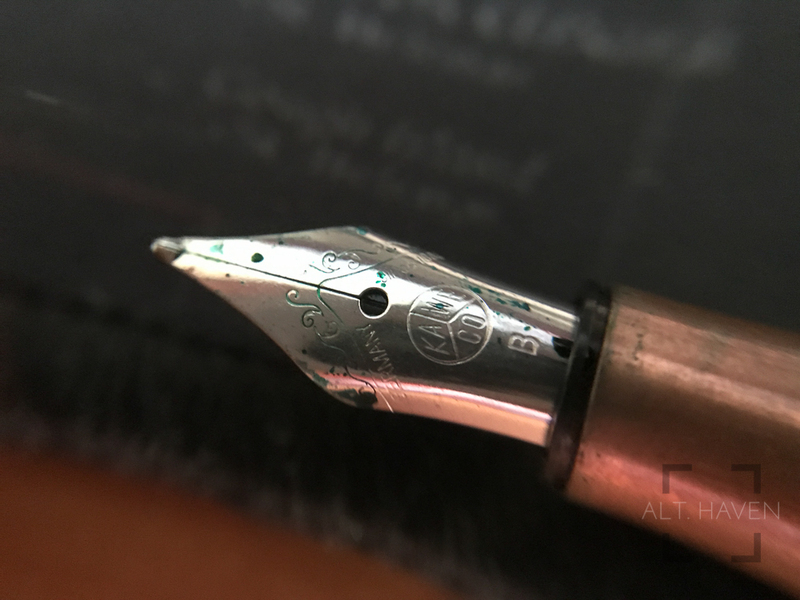 The Liliput comes a variety of nib options. They are all stainless steel nibs ranging from EF to BB. I had requested for a B nib for the Kaweco Liliput. That’s not a normal choice for me. The B nib is well, board. Far boarder than what I am used to but it is on the other hand not overly wet that makes it next to impossible for me to use. The B nib wants you to write big and bold. The nib is, for me, serviceable. It’s probably a better idea to pair this with a narrower nib options since it is for writing on the go. 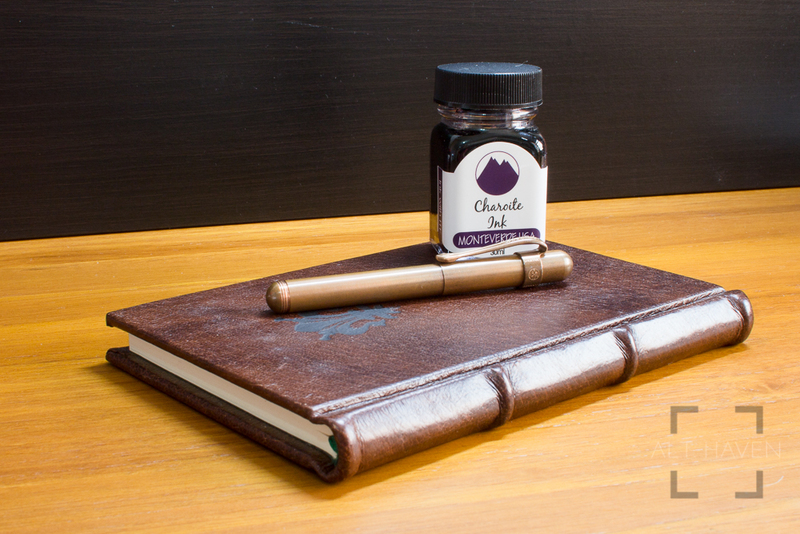 You undoubtedly don’t want to hang around waiting for your writing to dry before you can close your notebook. 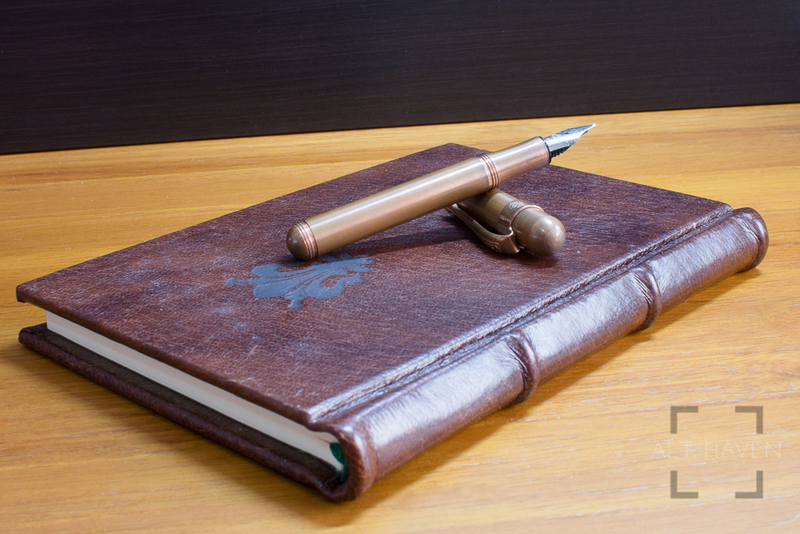 The Kaweco Liliput is a very specialised fountain pen. It wouldn’t work in all regular situations. As long as you keep this in mind, the Liliput will not disappoint you. Once again, my thanks to Cityluxe for lending me the pen for review.